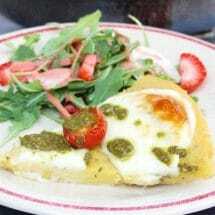 Be transported to Italy with this easy, gluten-free, and vegetarian Farinata with Tomato, Mozzarella, and Pesto. It’s Recipe ReDux time and I’m loving this month’s theme! Start unpacking your favorite vacation memories. Think about a trip you took state-side or internationally and create a healthy recipe from an unforgettable meal you enjoyed. Or, create a recipe from a native ingredient you saw or tasted on your travels. 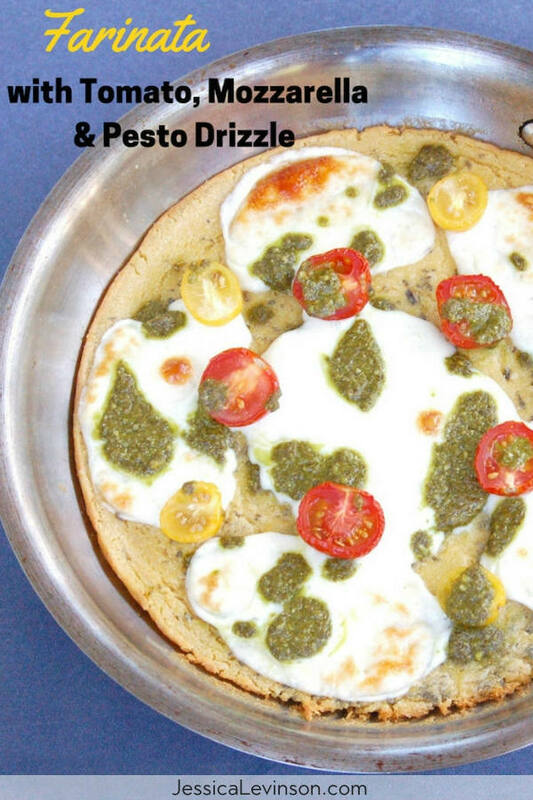 As soon as I saw this month’s theme I knew what I was going to make: Farinata with tomato, mozzarella, and pesto! Never heard of Farinata? Well, maybe you’ve heard of Socca, which is Farinata’s French cousin. I had farinata for the first time last September when hubby and I were in Genoa, Italy for my friend’s wedding, and I have been promising Mr. Nutritioulicious that I would make it since we got back. A year later and thanks to The Recipe ReDux I finally fulfilled my promise! Farinata, which literally means “made from flour” is a thin unleavened pancake made of chickpea flour mixed with water and olive oil. In its simplest form – which is how it was served in Genoa – it’s seasoned with rosemary and topped with salt and pepper. That’s it! 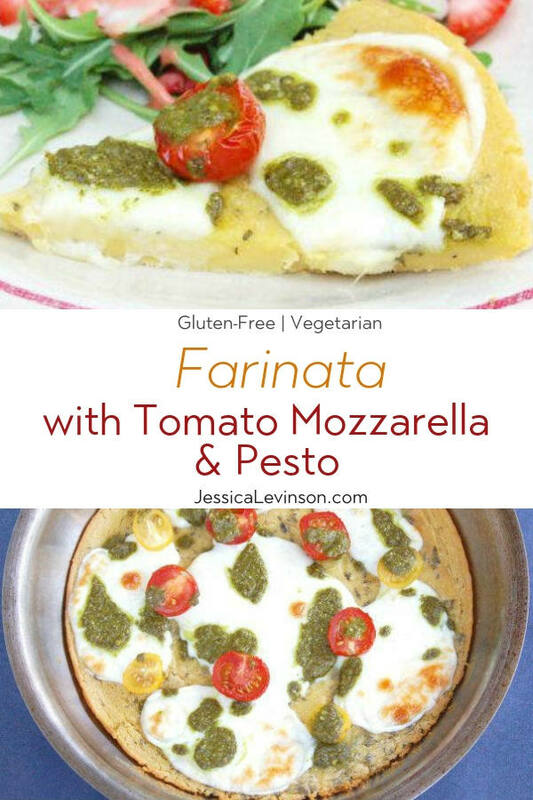 It’s delicious as is, but I loved the idea of using farinata as a flatbread or crust and a vehicle for other nutritious and delicious toppings. It’s really easy to make, perfect for anyone on a gluten-free, egg-free, dairy-free, and/or nut-free diet, and the dietitian in me loves that it’s higher in protein than traditional flatbreads thanks to the chickpeas. And what better time to celebrate chickpea flour than the International Year of Pulses! Be careful not to overdo it on the toppings, otherwise it may collapse when you take it out of the pan. The “crust” is not as firm as a traditional pizza crust. Traditionally, farinata is made in a copper pan, but home cooks often use a cast-iron skillet. I have neither, so I made one in a glass pie dish and another in my regular skillet. Both came out delicious, but the one in the pie dish was hard to remove without it falling apart. For best results use a shallow pan. I’m looking forward to making the farinata more often with a variety of toppings or even in the traditional way to serve on the side of bowls of soup as the weather gets cooler! 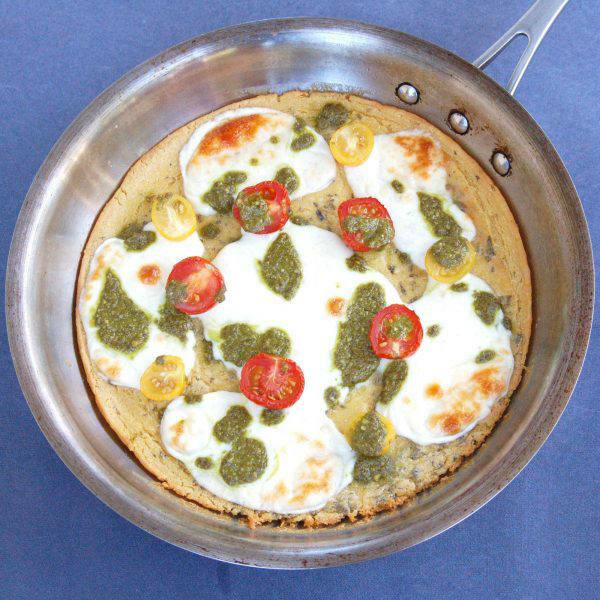 A chickpea flour crust is topped with tomatoes, mozzarella, and basil pesto in this easy, gluten-free, and vegetarian twist on the traditional Italian farinata. In a large bowl, whisk together the chickpea flour, rosemary, salt, and pepper. Slowly whisk in the warm water until smooth and lump-free. Whisk in 2 tablespoons of olive oil and let batter stand for at least 30 minutes. While the chickpea mixture is resting, preheat the oven to 450 degrees F and make the pesto. In a small food processor, combine all the pesto ingredients and puree until smooth. Transfer to a small dish, cover, and refrigerate until ready to use. When oven is preheated, coat 10-inch oven-safe skillet (or cast-iron if you have) with 1 tablespoon of the remaining olive oil and place in oven to heat for a few minutes. 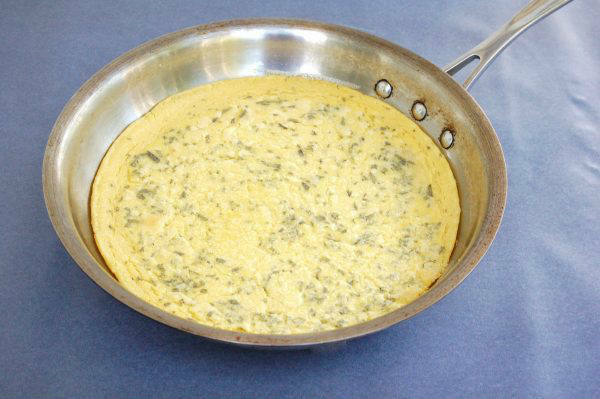 Carefully remove the skillet from the oven and ladle in half of the batter, tilting the skillet as necessary to ensure the batter is evenly spread. Return the skillet to the oven and bake 10 to 13 minutes until the farinata is set and the edges begin to brown. Remove skillet from the oven and top with half of the sliced tomatoes and mozzarella. Drizzle reserved pesto on top and return to oven for another 10 to 13 minutes until cheese is melted and starts to bubble. 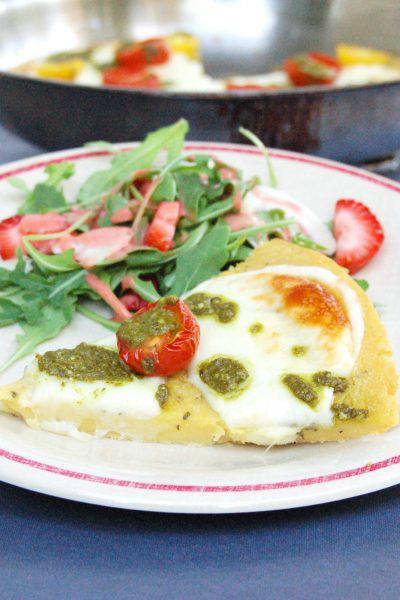 Repeat steps 4 through 6 with remaining tablespoon of oil, tomatoes, mozzarella, and pesto, to taste. Have you ever been culinarily inspired by a recipe you had on vacation? What would you top your farinata with? Love this! Italy is one of my favorite places! Thanks Betsy! One of mine too – I studied abroad there so it has a special place in my heart! This sounds amazing! I’ve been looking to play with chickpea flour ???? Thanks Lauren! Hope you try it! Thanks so much Sara! I love that there are so many variations you can make with it. Have fun playing around with it! On my list to make ASAP! And, dreaming about last years trip to Italy too 🙂 This looks so delicious Jessica! ah i love all things chickpea flour! we make besan (an indian chickpea flour pancake) at home a lot! Yum! I’ll have to check out how the Indian version is prepared! Yum!! You had me at pesto! 🙂 I love the combination with mozzarella! Thanks Liz! LMK if you give it a try! Thanks Abbey – it’s really yummy and I love that it’s higher in protein and fiber! I’m so glad to hear that! Hope you give this recipe a try!